Our clients are increasingly recognizing the need for a private cloud, but tell us that deploying one is time consuming and expensive. 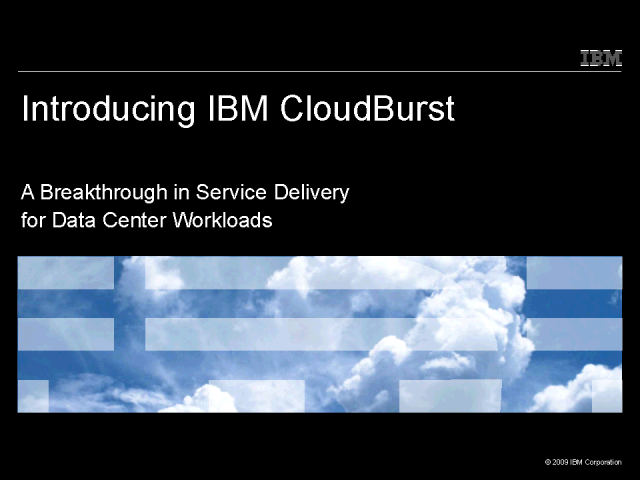 IBM is responding by helping companies transform data centers into Dynamic Infrastructures with the launch of IBM CloudBurst on June 16, 2009. IBM CloudBurst is a family of pre-packaged private cloud offerings that bring together the hardware, software and services to quickly and efficiently establish a private cloud. IBM CloudBurst takes the guess work out of establishing a private cloud by pre-installing and configuring the necessary software on the hardware and leveraging services for customization to your environment. IBM CloudBurst supports workloads with a high degree of integration, flexibility and resource optimization. Fit-for-purpose and self-contained, IBM CloudBurst dramatically reduces capital and operational costs, and delivers an accelerated investment payback. IBM CloudBurst is delivered with on-site "quick start' implementation service to offer secure, reliable, private cloud computing. All the customer needs to do is install applications to start leveraging the benefits of cloud computing, such as virtualization, flexibility, scalability and a self service portal for provisioning new services.